Forget Microsoft's just announced fitness band (called Band), the real surprise is the Heatlh, a new platform launched by Todd Holmdahl, corporate VP at the company. 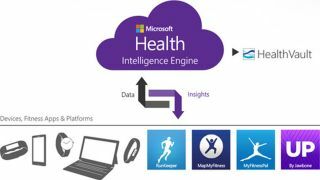 Dubbed an Intelligence Engine, Health includes both a consumer-facing aspect but also one geared towards the health and fitness industry that will allow the latter to store and combine data to create powerful insights, thanks to big data analysis. Other than basic health related features, Health will, in time, be able to communicate with your email and calendar to provide smarter and more powerful insights. One example suggested by Microsoft was about the impact on the number of meetings during the day on someone's sleep quality. For startups and the health industry, Microsoft will provide with API's, cloud storage as well as access to advanced algorithms and machine learning functionality. You will also be able to connect your Health Data with Microsoft's other health-related service, the 7-year old HealthVault, to share that data with your medical provider (GP or other). Holmdahl says that Microsoft will have a "regular cadence" of Microsoft Health announcements that will include products, SDK availability, apps and services.